BH-USA hoists run great in combination with a GEM boat lift Remote Control. The GEM GR1 Single Motor Boat Lift Remote is FCC and ETL listed and meets all federal requirements. Equipped with 30 AMP control relays. This model can control one boat lift motor on one lift. GEM manufactures the most powerful controller in the boat lift market and has developed the only system designed specifically for boat and personal water craft lifts. The GEM GR1 Single Motor Boat Lift Remote is water resistant and miniature remote control transmitters even float, if dropped in the water. 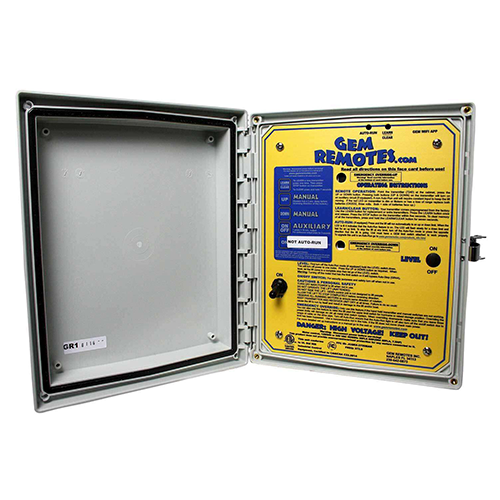 GEM boat lift Remotes have online technical support, complete with troubleshooting and wiring diagrams for each model. GEM boat lift remotes work on radio frequency, not line of sight, and can operate up to 300 ft away. All remotes come with one GEM transmitter and multiple transmitters can be added using the simple learn feature available on all GEM boat lift remotes.